We’ve arrived in Doolin and are very much enjoying the weather (70s and sunny), sites (Cliffs of Moher, the Burren) and the music (4 pubs within walking distance with sessions every night!). 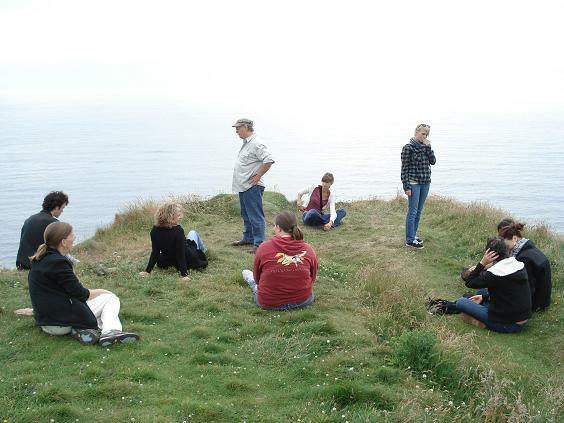 Our first evening here, John Daly came over to the hostel and led a session with us. After dinner, we wandered over to Gus O’Conner’s on Fisher Street to enjoy a session with John and Christy Barry. On day 2, we had a morning of music, Irish language and drawing classes with Geraldine, Maeve and Cillian Cotter at the Micho Russell Community Center. Geraldine taught tin whistle and piano, Maeve taught beginning and advanced fiddle, and Cillian taught flute, whistle, and drawing. All three taught us language because we needed all the help we could get! Then we were treated to a wonderful concert by all three. I’ll post music files when I get home… too hard to upload from the road. 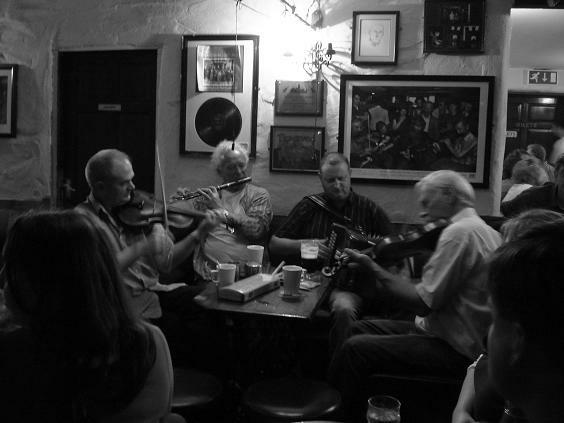 In the afternoon, we scatter to the wind – some going to the Cliffs, others to the Burren, followed by visits to several local pubs and another evening of great music. 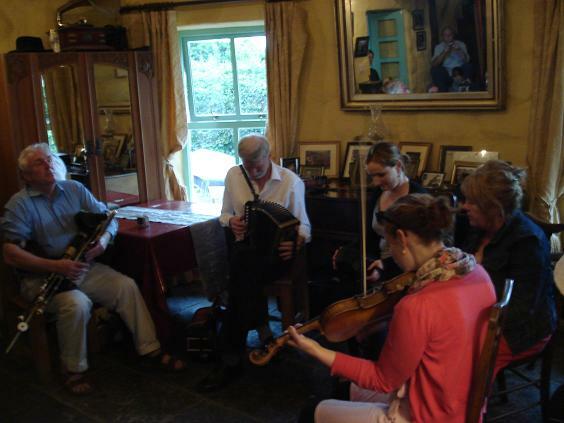 On Day 3 we traveled to Oranmore for classes in the home of Tommy Keane and Jacqueline McCarthy. Though we had a little trouble finding their home, it was well worth the trek. Tommy and Jacqueline had a beautiful old place with a thatched roof (pronounced “tached”). 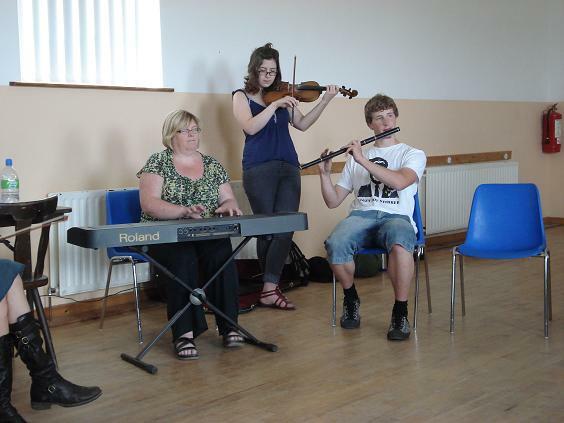 We had fiddle, singing, dance, box and repertoire classes followed by a fun session. 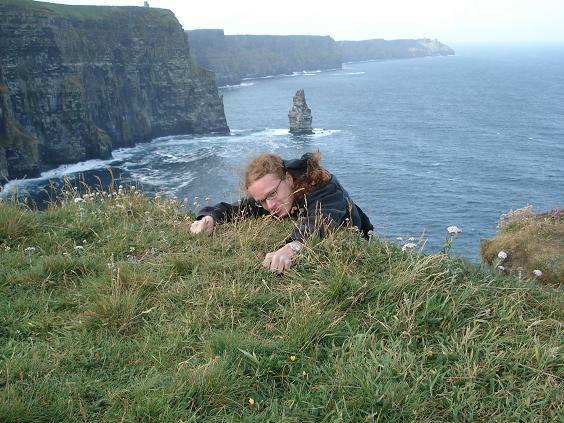 Our last day was a travel day, but Sean Deighan hadn’t had a chance to see the Cliffs of Moher yet, so we quickly ran up the path before we left… maybe we ran a little too fast… as we almost lost Sean. But don’t worry Mary, Sean’s fine now and in good hands. great pictures…thanks for sharing! I hope everyone is doing well and having a fun time!